It's more complicated to model a simple Lego brick than a Druid, according to Lego Universe developer NetDevil. Go ahead and fire up World of Warcraft, I'll wait. Okay, now look at your avatar decked out in anywhere from tier-0 to tier whatever-the-hell Blizzard is up to now. To create that must have taken some 3D modeling skill right? Sure, but not as much as it takes NetDevil to create a brick in Lego Universe. 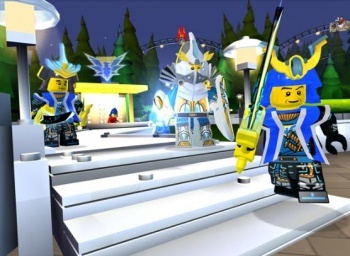 In an interview with Gamasutra, creative director for Lego Universe Ryan Seabury revealed that due to the Lego Group's "uncompromising" standards for the appearance of any Lego product, there is more to a Lego brick than an entire World of Warcraft character. The building blocks in the Lego MMO that players can use to create anything (but ideally not phalli) might look simple, but they're not. When asked about what it takes from a technological standpoint to manage a large number of player-created objects in the game, Seabury said: "There's a huge amount of technical magic that's happening in the background to make this feasible. We thought about rendering Lego bricks in real time, but they're complicated, actually." "People think they're just blocks, and they should be easy, but the level of detail with all the studs and the details on the other side... Lego is uncompromising about how those need to look," he added. "As a comparison, a two by eight Lego plate brick, a very simple brick, is about twice the polygons of say, a World of Warcraft avatar." Let's say Seabury knows exactly what he's talking about here: How is it possible? My guess is that while a Lego brick in real life might be simple, it has perfectly rounded male and female connector points. Where the circular male connectors touch the top of a Lego brick isn't just a stiff right angle, but a smooth curve. And don't forget that the bottom of a Lego piece is usually even more complicated than the top. To model this could potentially take a lot of polygons, if I'm understanding correctly. World of Warcraft avatars look just dandy, especially the more they glow thanks to various armor and weapon upgrades, but they do have their share of sharp edges and "round" surfaces with corners. To get rid of that takes polygons, which means that a 2x8 Lego brick just might be more complicated to render than a hero that has the ability to slay the most terrible evils in the universe.